Learning letters can be a little boring for little people, so I have tried to put in as many fun ways to learn as possible. 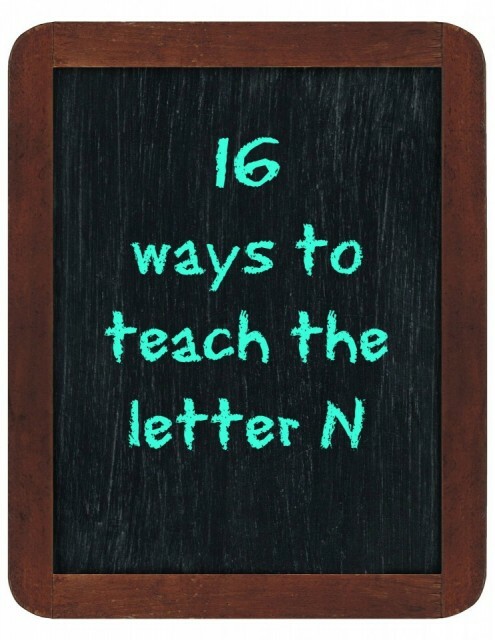 This week we are looking at the letter ‘n‘. I do hope you find something here that you can do with your child. ‘n’ is for needle: Use a needle to sew around a cardboard letter ‘n’. The large plastic needles are good. Use a hole punch to make large holes for him to sew through. ‘n’ is for nails: Partially knock nails in the shape of a ‘n’ into a piece of wood. Have your child knock the nails in with a hammer. He can then weave colourful wool in and out around the nails. ‘n’ is for number nine: Draw a large number nine and have him write 9’s all over the larger 9. This links number work with literacy. ‘n’ is or necklace: Make a pasta or bead necklace, use 9 bead/pasta pieces. ‘n’ is for nurse: Dress up as a nurse and play doctors and nurses. ‘n’ is for noise: Get noisy, make a noise using nine different instruments. ‘n’ is for names: can you find names that have ‘n’ in them? Make a list. Does your name have an ‘n’. Write the ‘n”s in a different colour. ‘n’ is for nest: make bird’s nest snacks using all bran and chocolate with chocolate eggs in them. OR Make a nest out of half 2 halves of a paper plate to create a envelope and tuck some chicks into the nest. Decorate the nest with torn paper or straw/hay. Open a play restaurant. Have your child role play as a chef and serve you up noodles, naan bread, nectarines, new potatoes, nougat, nuggets, nuts, nutella etc. You could create a real meal together using some of these foods for your lunch or supper. ‘n’ is for nose: dampen a few cotton balls with smelly liquids: try lemon juice, coffee, bubble-bath, vanilla essence, tomato sauce. Blindfold your child and have them use their nose to tell them what they are smelling. Thanks for stopping by to find out about about how to help your child learn to read. I had fun compiling this list of activities and hope that you find the them helpful. Please take a look at my other posts for more educational activities and ideas.